Here's the original press release announcing Dave Mustaine's new guitar, manufactured by Dean Guitars. Iconic hard rock guitarist DAVE MUSTAINE of MEGADETH and DEAN GUITARS have announced a new guitar line called the “VEHEMENT: VMNT,” and unveiled the new instruments today (January 19) at the N.A.M.M. (National Association of Music Merchants) convention in Anaheim, CA. MUSTAINE and DEAN GUITARS joined forces late last year and are working closely on the specifications of the guitar line. The initial model in this exclusive line will be limited to a worldwide run of only 150 pieces. This guitar will be a signature Mustaine V with a heavily flamed top, Dave Mustaine custom Live Wires pickups, ebony fingerboard and gold hardware. Players and collectors can choose from three finishes--Transparent Amber, Transparent Red and Transparent Black. 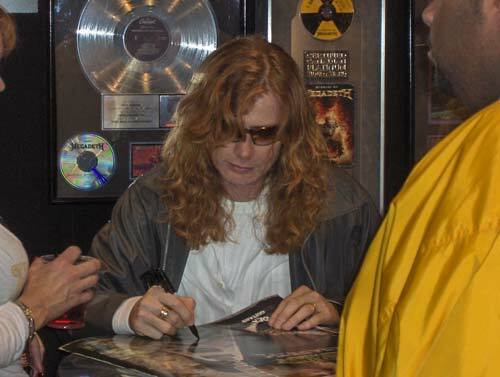 The guitar will include a stenciled hardshell case and a Deth certificate hand signed by Dave Mustaine himself. The second guitar is the Dean Dave Mustaine VMNT import complete with the custom Live Wires pickups, Grover tuners and hardshell case. The guitar is available in Classic Black or Metallic Silver and the first 500 sold will include a Megadeth CD signed by the man himself. Retail price of the Dean VMNT is $1520. For more information, hit this link http://www.deanguitars.com/home.php. You'll hear the Megadeth tune, "Gears Of War." 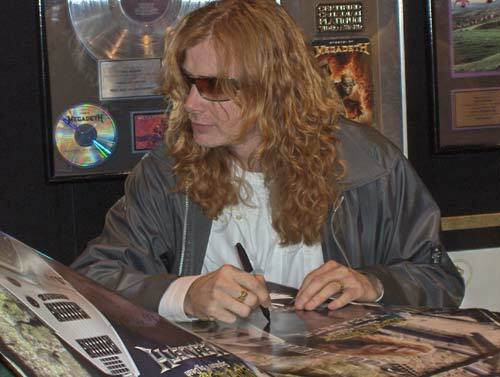 Also check out the Dave Mustaine VMNT Series at http://www.deanguitars.com/dean_winter_07/.